The Limon Leader / Eastern Colorado Plainsman: Lincoln County Oil Production. Lincoln County experienced a small “oil boom” during 2013 with an unusually high number of new drilling permits being issued. According to John Dewitt, Lincoln County Land Use Administrator, his office saw a surge in applications for well permits last year that it had not seen previously. 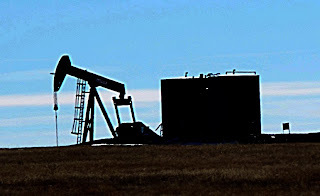 As of the first week of January 2014, there are a total of 182 oil wells in Lincoln County. While issuing more than a hundred well permits last year may sound impressive, DeWitt cautioned it is not that many compared to some other areas in Colorado. Asked if last year’s upsurge in applications for drilling permits will continue into 2014, DeWitt said he could not make any predictions. Currently, there are four main areas in the county where oil wells are operating or are being drilled. A second area is north of County Road 94. Fifteen wells are permitted in that area. DeWitt said the most recent well drilling area to become active is off County Road 35 in northern Lincoln County. A total of 20 different companies are operating or working to develop oil well sites in Lincoln County. Over the past several decades, a total of 629 oil wells were permitted in Lincoln County by the State of Colorado through its Oil and Gas Conservation Commission. Lincoln County has been tracking oil well development inside the county for several years. Unlike some other counties in the state, it requires oil well developers to get a county permit before drilling. “The State of Colorado requires a permit for all oil and gas drilling,” DeWitt said. “Lincoln County has also asked developers to get a county permit which is free of charge. One reason we asked them for a county permit is that it gives the Assessor’s Office a heads-up. While a state permit is mandatory before drilling, DeWitt said the county permit is not. However, the Colorado Oil and Gas Commission supports the county permits. Of the active wells in the county, only three have used hydraulic fracturing or “fracking,” a drilling technique that is considered to be controversial by some. The safety record for the drilling operations in the county have been generally good for both the public and the environment. Are the people who own the mineral rights getting paid?